The simplest way to bind work into a portfolio book without punching holes or using page protectors. 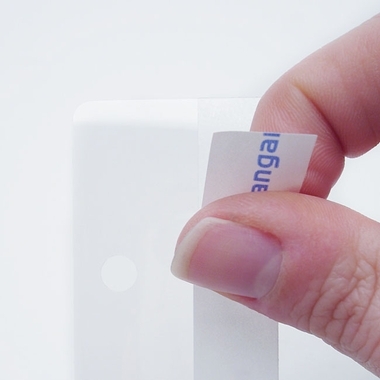 To use, start by peeling back the release liner to expose the archival adhesive. 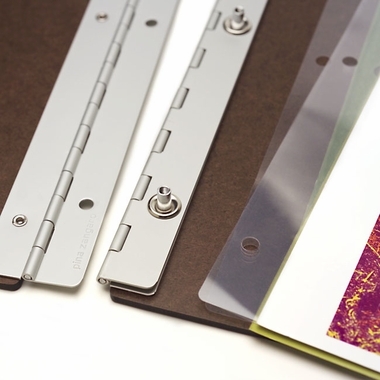 Then adhere your artwork to the adhesive edge and place the sheet into your portfolio book or binder. Works with screwpost portfolio books and 3-ring binders (but not with multi-ring portfolios). 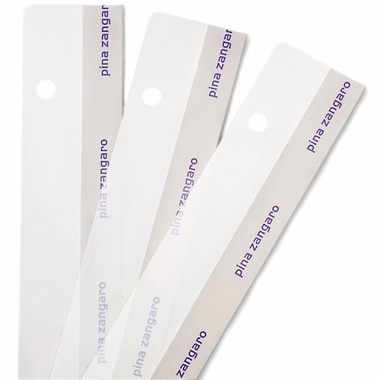 Made of archival grade DuPont polyester, these hinge strips will not damage your work over time, are perfectly clear and will not tear. Available in six lengths with standard hole configurations and packed in tens in a protective metallic, resealable bag. Note: When using these hinge strips in 8.5"x11" landscape 3-ring binders, it may be necessary to punch an extra hole in the middle of the strip to match the proprietary hole spacing of the binder.